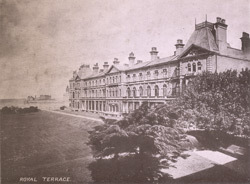 General view of Royal Terrace in Weston-super-Mare, the Victorian seaport and resort town situated on the Bristol Channel in south-western England. Royal Terrace overlooks the Knightstone Bath House which can be seen in the background, just off the mainland. This is the last in a series of 16 cabinet card views of the town published in the book 'Weston-Super-Mare Photographed.' In the 1880s Cabinet Card photographs eventually replaced the smaller carte de visite format. As the name suggests, the cabinet image was large enough to be displayed on a side table or bureau. They remained in vogue until the turn of the century when they were superseded by the photographic picture postcard.